The BC Coroners Service is currently conducting an inquest into the death of Lucia Vega Jimenez. 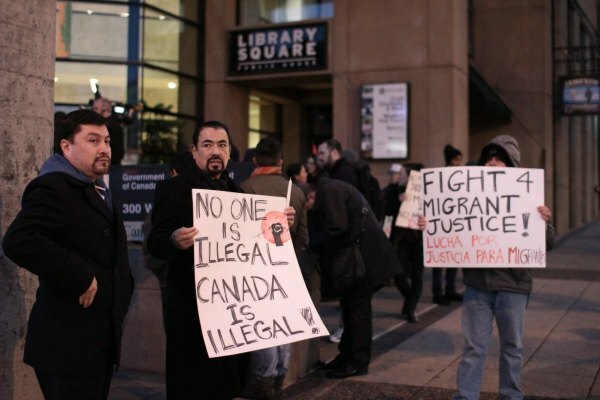 Jimenez was a 42-year Mexican hotel worker who died while in Canadian Border Service Agencyâ€™s custody in December 2013 after being turned over to immigration authorities by TransLink police. 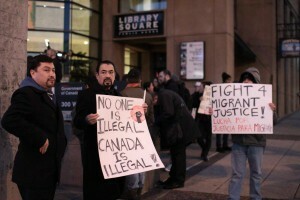 Just prior to her scheduled deportation to Mexico, she hung herself in a cell at the Vancouver International Airport. She died eight days later, on December 28, 2013. As part of a coalition of grassroots immigrant, community and Latin American groups, we have been denied participant status at the inquest. With the inquest coming to a close, we would nonetheless like to take this opportunity to reiterate our vision and demands. 2. Compensation to Luciaâ€™s family particularly since she was the main economic support for her ailing mother. Over the past ten years we have supported migrant detainees on a daily basis and have organized against the injustice of migrant detention. Seeking asylum is a right yet an increasing number of people who have been forced to flee their homes are being placed behind bars in Canada. They are held in conditions of imprisonment that are fundamentally inhumane and degrading. Last year alone, 10,088 people were detained by the CBSA (one of them was Lucia). This included over 200 children. These migrant detainees spent a total of 183,928 days in immigration detention. One-third of all migrant detainees are held in provincial prisons, including in maximum-security facilities. Migrants are the only population within Canada who can be incarcerated simply on administrative grounds without being charged with a specific criminal offence. Unlike those charged with the offences under the criminal (in)justice system, migrant detainees are not sentenced and so have no idea when they will be released. Migrants are essentially detained for trespassing an artificially created border on stolen Indigenous lands. 5. Addressing the root causes of displacement and migration. 8. An end to the two-tier discriminatory refugee system and designated countries of origin (â€˜safe countriesâ€™) under the Refugee Exclusion Act. 9. Increased transparency by CBSA (without violating detainee privacy rights) to include disclosure by CBSA on a monthly basis about how many detainees are in CBSA custody, in which holding center, and for what length of time. 17. Access to exercise equipment, yard time, fresh air, and windows. 4. Measures that purport to increase detainee safety but that, in effect, increase scrutiny and invade privacy such as cameras and regular cell checks that involve, for example, waking up detainees. As grassroots anti-colonial migrant justice organizers, we struggle for the right to remain, the freedom to move, and the right to return. We are all human and are not inferior or undesirable due to our migration status, race, gender, class or ability. We actively strive for a humanity where everyone has the right to sustenance and the ability to provide it, where we are all free of oppression and exploitation, where each of us has control over decisions that affect our bodies and our communities, and where everyone is able to live meaningfully in respectful and responsible relationships to one another and the earth.